A virtual directory is a directory name that you specify in IIS and map to physical directory on a local server's hard drive or a directory on another server (remote server). You can use Internet Information Services Manager to create a virtual directory for an ASP.NET Web application that is hosted in IIS. The virtual directory name becomes part of the application's URL. It is a friendly name, or alias because an alias is usually shorter than the real path of the physical directory and it is more convenient for users to type. A virtual directory receives queries and directs them to the appropriate backend identity repositories. It integrates identity data from multiple heterogeneous data stores and presents it as though it were coming from one source. 1. 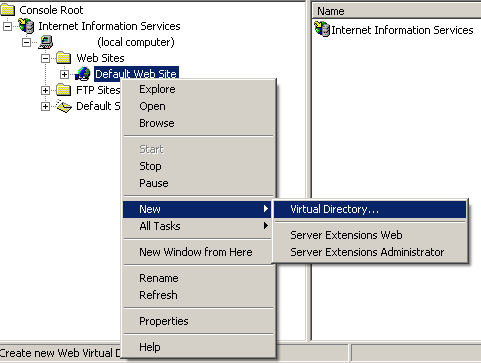 In IIS Manager, expand the local computer and the Web site to which you want to add a virtual directory. 2. Right-click the site or folder in which you want to create the virtual directory, click New, and then click Virtual Directory. 3. In the Add Virtual Directory dialog box, at a minimum enter information in the Alias and Physical path and then click OK.